Win Tickets to the Patriots AFC Championship Game at Gillette Stadium! You have until Thursday, January 17th at 5pm to enter this fantastic prize, valued at $1,700! 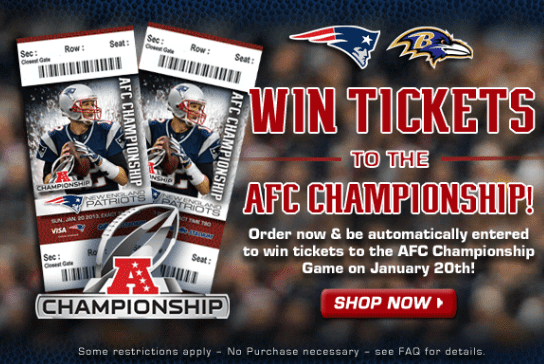 And to double your chances, order from the Patriots ProShop to be automatically entered to win tickets to the AFC Championship Game on January 20, 2013! For more information, please click here.